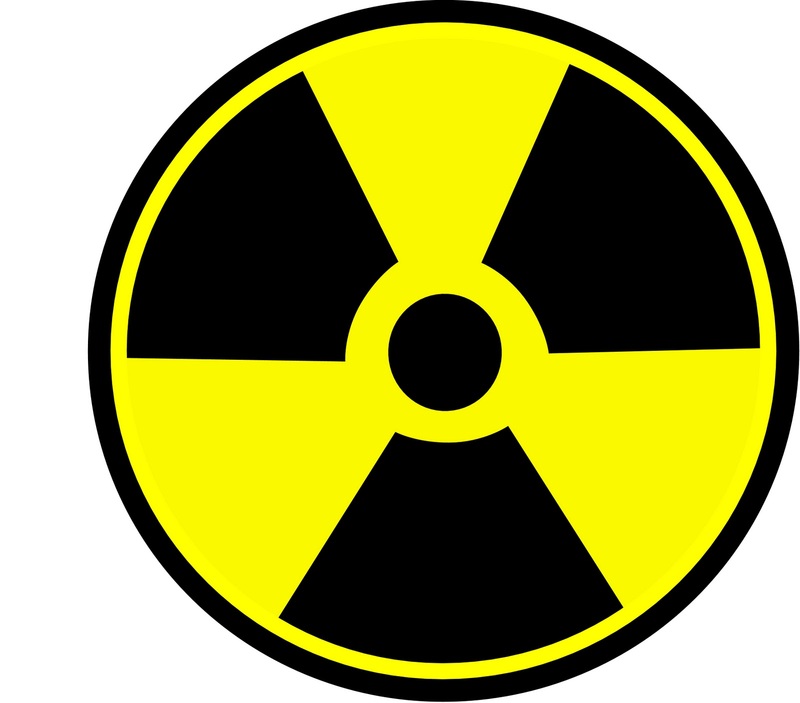 However, what if some unforeseen disaster threatens us with living, radioactive pathogens? 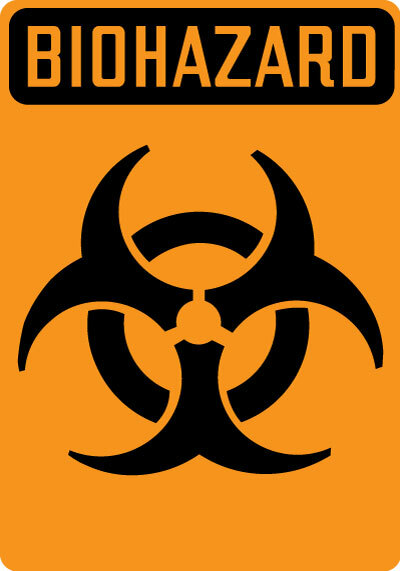 Clearly, we need a radiobiohazard symbol for just such an eventuality, and I’m proposing the top picture here as a rough draft for one, inspired by the two already-existing warning symbols. To the TSA, FEMA, the NSA, and the rest of the alphabet soup of “keep-us-safe” agencies: you’re welcome. 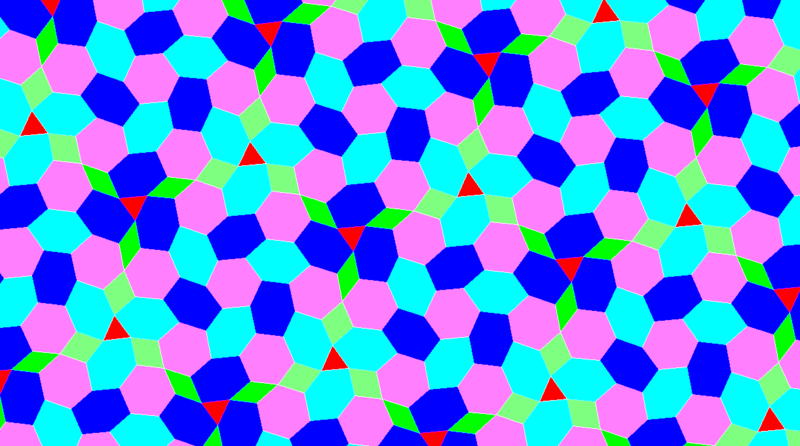 In this chiral tessellation, the blue triangles and green hexagons are regular. The yellow hexagons are “Golden Hexagons,” which are what you get if you reflect a regular pentagon over one of its own diagonals, then unify the two reflections. The pink and purple quadrilaterals are two types of rhombi, and the red hexagons are a third type of equilateral hexagon. All of the edges of all polygons here have the same length. There are three different types of points of three-fold rotational symmetry repeated here. Two of these types are centered in the middle of blue triangles, while the third is centered in the middle of some of the green hexagons — specifically, the ones surrounded only by alternating red and yellow hexagons. If you drink alcohol, and are about to travel in Arkansas, you might want to buy your booze before your trip. You can’t buy liquor on Sundays or religious holidays (a blatant First Amendment violation) in this state. In some counties, first-time visitors learn the term “dry county” when they are told by a clerk that they can’t buy alcohol there on any day of the week. Yes, we still have prohibition here, in many parts of Arkansas! If you see the sign above, and have you have the urge to utter “Arkansasssss,” pronouncing the “s,” you’d better do it quickly, if you want to mispronounce the name of our state legally. Once here, it’s actually against the law. Husbands can even legally beat their wives here . . . but only once a month. This is the Main Street Bridge across the Arkansas River. It separates Little Rock and North Little Rock. 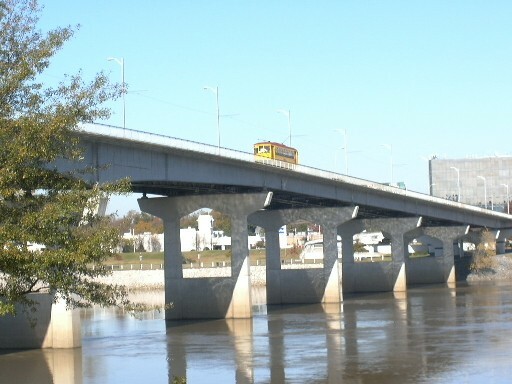 Perhaps as a flood-control measure, our state legislature (#50 among American state legislatures in college achievement) passed a law forbidding the Arkansas River from rising above the level of this bridge. Why Is Arkansas Political Geography Such a Mess? Technically, we live within the city limits of North Little Rock, but we’re surrounded by Maumelle, and also live in the Pulaski County Special School District, not the North Little Rock School District. Telling people we live in NLR causes confusion, so we say “Maumelle” instead, but mail won’t reach us unless it includes “North Little Rock” in the address. What’s more, that’s all in one county, Pulaski, near the center of the state. The weirdness doesn’t stop there. Nearby is a city named Conway. I went to college there. It isn’t located in Conway County, though; that’s further West. Head Southwest on I-30 from Little Rock, and you’ll soon encounter Benton (not in Benton County, although at least Bentonville is), and then get a chance to take an exit to go visit Hot Springs — but you won’t find it in Hot Spring County. Van Buren is right next to Oklahoma, and a long drive from Van Buren County. Is the City of Jacksonville to be found in Jackson County? Of course not — not in this state. Boonville, similarly, is not located in Boone County. We have a Mississippi County here, and it borders two other states. We also have a long border with the state of Mississippi. 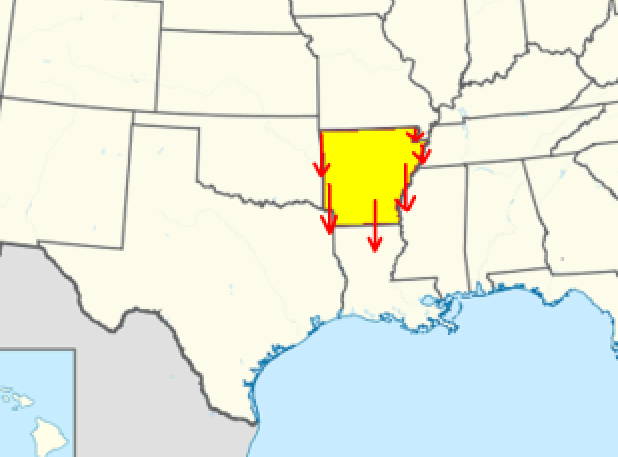 However, Mississippi County, Arkansas isn’t one of several counties which do border the State of Mississippi. Instead, it borders Tennessee and Missouri. Yes, all six states which border Arkansas are technically South of us, in a sense. Perhaps the strangest thing about Arkansan political geography is that the town of Lonoke is actually in Lonoke County. It’s even their county seat. What are they trying to do there, confuse people? This is not the only truncated form of the rhombic dodecahedron. In this polyhedron, square-based pyramids have been “truncated away” from the rhombic dodecahedron’s four-valent vertices, but the three-valent vertices remain untouched. If this truncation is done in such a way as to leave the hexagonal faces equilateral (which is not done here), so that all edges of the polyhedron have the same length, the result is called a “chamfered cube.” This closely-related figure may be seen at https://en.wikipedia.org/wiki/Chamfered_cube. The Beginning of the Number Pi, in Binary Through Hexadecimal, etc. Binary (base-2) pi: 11.00100 10000 11111 10110 10101 00010 00100 00101 10100 01100 00100 01101 00110 00100 11000 11001 10001 01000 10111 00000 . . .
Trinary (base-3) pi: 10.01021 10122 22010 21100 21111 10221 22222 01112 01212 12120 01211 00100 10122 20222 12012 01211 12101 21011 20022 01202 . . .
Quaternary (base-4) pi: 3.02100 33312 22202 02011 22030 02031 03010 30121 20220 23200 03130 01303 10102 21000 21032 00202 02212 13303 01310 00020 . . .
Quinary (base-5) pi: 3.03232 21430 33432 41124 12240 41402 31421 11430 20310 02200 34441 32211 01040 33213 44004 32444 01441 04233 41330 11323 . . .
Heximal (base-6) pi: 3.05033 00514 15124 10523 44140 53125 32110 23012 14442 00411 52525 53314 20333 13113 55351 31233 45533 41001 51543 44401 . . .
Septenary (base-7) pi: 3.06636 51432 03613 41102 63402 24465 22266 43520 65024 01554 43215 42643 10251 61154 56522 00026 22436 10330 14432 33631 . . .
Octal (base-8) pi: 3.11037 55242 10264 30215 14230 63050 56006 70163 21122 01116 02105 14763 07200 20273 72461 66116 33104 50512 02074 61615 . . .
Nonary (base-9) pi: 3.12418 81240 74427 88645 17776 17310 35828 51654 53534 62652 30112 63214 50283 86403 43541 63303 08678 13278 71588 . . .
Decimal (base-10) pi: 3.14159 26535 89793 23846 26433 83279 50288 41971 69399 37510 58209 74944 59230 78164 06286 20899 86280 34825 34211 70679 . . .
Undecimal (base-11) pi: 3.16150 70286 5A48 . . .
Duodecimal (base-12) pi: 3.18480 9493B 91866 4573A 6211B B1515 51A05 72929 0A780 9A492 74214 0A60A 55256 A0661 A0375 3A3AA 54805 64688 0181A 36830 . . .
Tridecimal (base 13) pi: 3.1AC10 49052 A2C7 . . .
Tetradecimal (base-14) pi: 3.1DA75 CDA81 3752 . . .
Pentadecimal (base-15) pi: 3.21CD1 DC46C 2B7A . . .
Hexadecimal (base-16) pi: 3.243F6 A8885 A308D 31319 8A2E0 37073 44A40 93822 299F3 1D008 2EFA9 8EC4E 6C894 52821 E638D 01377 BE546 6CF34 E90C6 CC0AC . . . In each of the above counting systems, pi’s expanded form retains the usual properties of irrational numbers: the digits don’t ever terminate, nor settle into a repetitive pattern. It also isn’t possible, in any of these counting systems, to express pi as a/b, where a and b are whole numbers in that base. However, in base-pi, the number pi is simply written this way, in its entirety: 10. Also, the square of pi is written 100, pi-cubed is written 1000, etc. However, if you want to try to figure out how to write, say, the decimal number ten, in base-pi, best of luck to you.